Loom Knit Shawls Vol. II is a multi-part .pdf ebook, that includes seven patterns in a 24 point large print text file (90 pages), a 12 point paper-saver file (36 pages), cover, 6 pages of photos, and two pages of diagrams. The files are kindle, tablet and screen reader friendly. 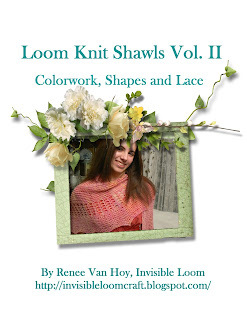 A full preview of the patterns from “Loom Knit Shawls Vol. II: Colorwork, Shapes and Lace” may be seen at Invisible Loom. I'm a dunce when talking about downloading. Can I download this to my laptop computer or just what's mentioned above? You may download this to any computer. If you are a Ravelry member, it will also be stored in your library on Ravelry, so you may access it when you don't have your computer. Your looms may work better with the Little Scarves e-book, which is sized to work with your looms. I purchased these and I'm trying to make the waves of lace pattern. I'm confused about row 12 and the TY directions. Can you help? How can I contact you? Hi Megan. You should have a contact for me on the email you received with the pattern link.